Investing in a time and attendance systems may not be the first thing small business owners think of when considering ways to achieve their expected revenue growth. Improving customer service and investing in new customer acquisition methods are cited far more often, but failing to do so is taking a risk. According to a report by AffinityLive, failing to properly track time spent working costs the average professional services business over $110,000 in lost revenue each year. While we’ve allowed technology to transform the way we communicate and do business, time and attendance software has lagged behind, forcing employees to recount their work days and hours manually, often days later. An unwillingness to make the switch to an automated time and attendance system is often due to a dearth of knowledge on the subject, usually pertaining to cost, usefulness and prevalence. With that in mind, here are 10 things you didn’t know about time and attendance software that will convince you to upgrade your system, if you haven’t already. 1) Use of automated time and attendance software is lacking, despite obvious financial advantages. Research showed that 40 percent of U.S. businesses calculate payroll by hand as of last year, and 46 percent told GoDaddy that they don’t use an accountant at all. That means that almost half of American businesses are missing out on ways a time and attendance system can save them money. 2) Businesses that automate their workforce management see enormous reductions in time spent on administrative tasks and in clerical errors. According to the Aberdeen Group, automated workforce management (which includes time and attendance software, scheduling and payroll) reduced time spent on workforce management by HR for 39 percent of respondents; 36 percent saw reductions in clerical errors; and 31 percent experienced reduced labor costs. 3) Using automated time and attendance software is a common trait among successful businesses. The Aberdeen Group says 88% of “Best-In-Class” companies automate their time and attendance data collection. Recent adopters of time and attendance software include the U.S. Army, the University of Oxford and the Arizona Cardinals, along with countless small businesses across the country. 4) The amount of time saved by switching from manual to automated time and attendance can actually be calculated. Industry estimates say that it takes an average of seven minutes for supervisors to calculate time-card data for each individual employee every pay period. With that time eliminated thanks to automation, some companies have found that calculating payroll takes less than a quarter of the time that it used to. 5) Time fraud is surprisingly prevalent in the workplace. A Kessler International survey found that employees are more likely to steal from their employers than customers, often by falsifying time records, “buddy punching” and not clocking out for unpaid breaks. 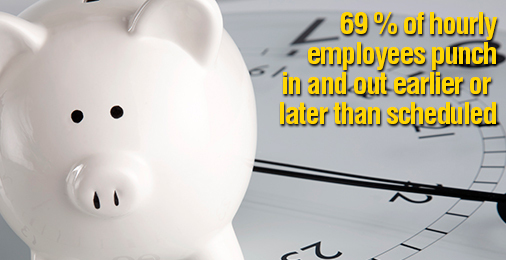 As many as 69 percent of hourly employees punch in and out earlier or later than scheduled. 6) Only filling out a daily (or better) timesheet ensures a record that is “somewhat” to “very” accurate. The majority of timesheets filled out multiple times a week or worse are only “somewhat accurate.” Moving from a weekly to daily system would recover $52,000 per professional, per year, in billable time. 7) Most people don’t track their time correctly because they don’t include one of the most basic facets of work. According to the AffinityLive report, 51 percent of respondents rarely or never track their time spent reading and answering emails. This is an enormous loss considering how common emails are in our daily work lives. Additionally, 28 percent of respondents said the same for meetings, another crucial element that should be included. 8) Automated time and attendance can keep you on the right side of the law. Not paying employees for time in meetings and reading emails can be costly: In recent years, the number of fair-wage practice lawsuits has increased dramatically, leading to hundreds of millions in back wages being recovered by the U.S. Department of Labor. Additionally, new regulations from laws such as the Affordable Care Act requires understanding who has qualified for health care during a specific time period, a task made much easier by having automated data that can easily be referred to. 9) The need for office supplies, which are often the target of theft and need constant replenishing, will be reduced. Getting rid of manual timekeeping means no more paper timesheets, fewer writing utensils and less of a need for things like printer ink, toner and other office supplies. Businesses will save money thanks to improved payroll accuracy, less money spent on the items themselves and reduced theft. 51 percent of employees polled by Kessler International say they’ve stolen office supplies for personal use. 10) Automated time and attendance allows for self-service access by employees, which is a powerful tool that increases engagement. Communication is important for letting employees feel like they’re a part of a team. Self-service options in time and attendance software allow both employees and managers to look up hours logged on the fly, improves accuracy, and show increased engagement in their work (72 percent of employees at companies with automated time and attendance rated themselves as highly engaged, compared to 64 percent without). Knowledge is power, and in this case, knowing how a time and attendance system drastically affects your company’s bottom line can be the difference between success and failure. 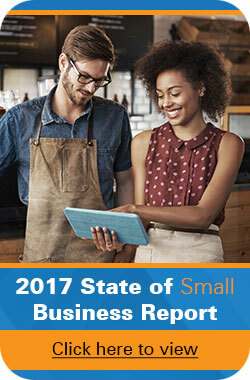 The margin of error is too small for most small businesses not to clean up inefficiencies in their model, and that includes the inefficiency that is manual time and attendance keeping. How would upgrading your company’s time and attendance systems not only save you money through eliminating human error, but also on the administrative end? I agree Ann! That’s why using an automated time and attendance system is so efficient.